LiveAuctioneers has an interesting find described as a circa 1900 Folk Decorated Canoe Paddle. The 61 inch paddle has a pretty standard shape but the blade is decorated on both sides with some etchings. One side of the blade has the words "Travail Vainc Tout". Loosely translated it means "Work vanquishes all". The other side features a Gibson Era woman with some initials and additional artistic etchings of birds. 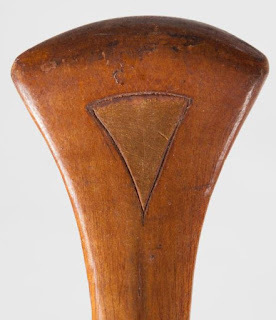 Even the plain shaped grip has a bit of decorative flair with triangular etching on the face. Interesting, I wonder where this paddle comes from? Interesting, I wonder where the paddle is from? Unfortunately no info on the listing, but the original auctioneer is located in Amesbury, Massachusetts close to Boston. Maybe it was one of those paddles used for romantic leisure daytrips in the area at the time?